☆ Bring you Convenience: Simultaneously read and write on two cards. Convenient usage and simple solution for transfering files. 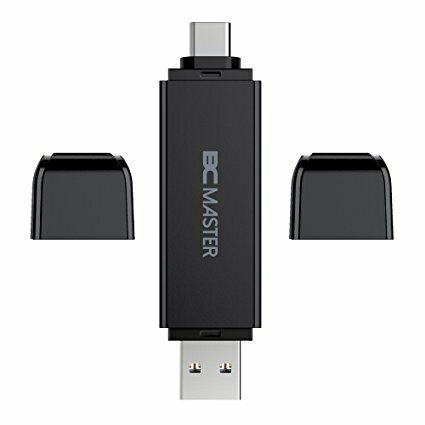 ☆ Multi-functional: USB-C, USB-A Ports, OTG Adapter for MacBook, Computers, Mobile Phones. Read almost all your memory cards with convenience. ☆ Indictor Light: Led indictor will light for card insertion and data transfer. Easily see whether it is working or not. ☆ Portable: Small, lightweight, and portable for business trip and travel. ☆ What you Get: 1 SD/Micro Card Reader, Lifetime Warranty and friendly customer service.